Can you believe college graduations are about to take place? Students are saying goodbye to college life and hello to the working world! Here a list of grad gift ideas to help them start the new chapter in their lives. A classic briefcase is something that will never go out of style. Monogrammed stationary because letter writing will never be a thing of the past. Business card holder for the grad that already has a job lined up. A cute weekender bag for fun road trips or quick business trips. Nikon DSLR to capture the new memories to be made. This travel book to inspire upcoming vacation plans. 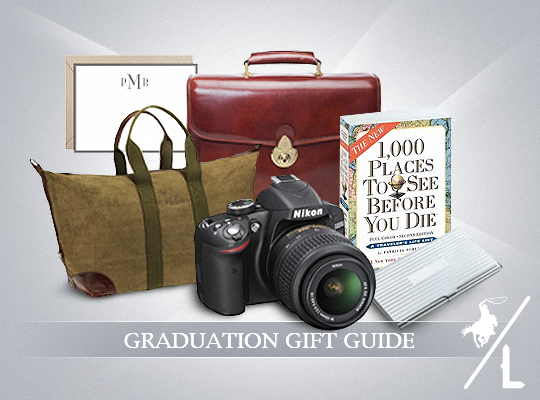 What do you think is the perfect graduation gift? Love the idea of a DSLR! A new computer would be great too! Sometimes after 4 years of undergrad, a new one is needed! That is an awesome idea for a graduation gift! Thank you so much for sharing it at the #SmallVictoriesSundayLinkup! This is a great idea! I'm featuring this post on our #SmallVictoriesSundayLinkup this week, hope you'll stop by and share again! Great ideas, that book looks really interesting! Thanks for sharing with us at Pin-Worthy Wednesday!